Kirk Gibbs broke through for his first win in CDR Yamaha Monster Energy team colours when he claimed victory at round three of the MX Nationals, held under perfect skies in Broadford, Victoria, over the weekend. 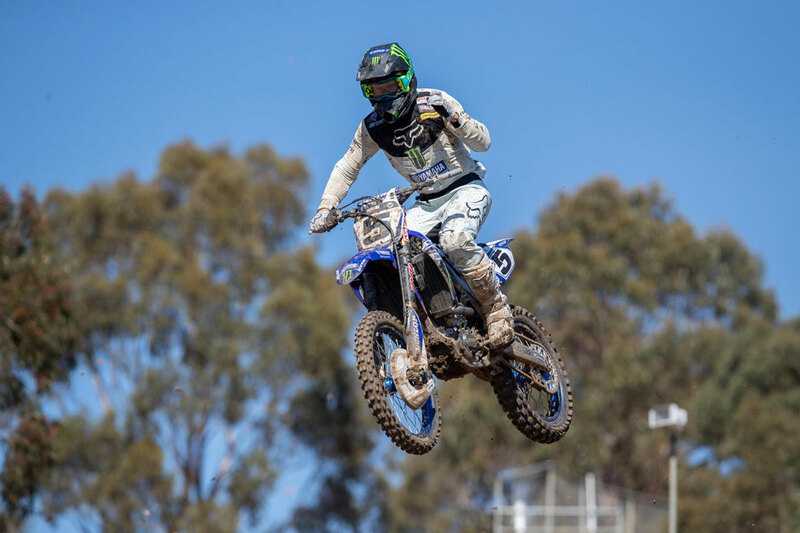 And to make it an even more memorable day, Luke Clout made it a team 1-3 as he pulled down third overall for the round and now both riders sit inside the top three in the MX1 division as the championship moves to Murray Bridge for a huge double header weekend of racing on May 4 and 5. Round three marked the first weekend for the sprint format for the MX1 class where the riders competed in two, nine lap back to back races as well as the more traditional thirty minute moto later in the day, making for a gruelling day at the track. With three motos all contributing to the round overall, consistency becomes a major player in the final results and when you think of consistency, you think of Kirk Gibbs. Despite shaking off the effects of a virus, Gibbs did what he does best and put his YZ450F at or near the front in each and every moto. He finished the day with 2-2-1 results and tied on 67 points with Todd Waters but gets the round win due to a stronger finish in the final moto. 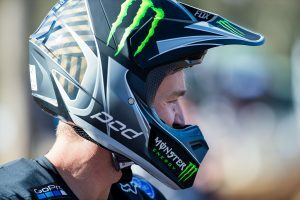 For Gibbs, it was a good recovery from a tough opening two rounds where he dealt with crashes and bad luck but he now has the train back on the tracks and heading into his favourite track of the season, Murray Bridge, Gibbs is well-placed to continue building momentum in the championship. “The weekend was much better for me and it’s nice to finally get a win under my belt for the CDR Yamaha Monster Energy Team,” Gibbs begins. “It was also good to have a dry round and actually get a gauge of how things are progressing and what our strengths and weaknesses are as the first two rounds were extremely wet and difficult to get a handle on the opposition as well as our own riding. “But, really pleased to get the win and get my season back on track. The team did a great job again today and my bike was working well on a pretty technical race track. We now have a couple of weeks off before Murray Bridge so lots of riding and training still to be done and lots of laps still left in this championship,” Gibbs ends. Luke Clout backed up his round two victory with a third place overall at Broadford in another fine performance. Clout improved as the day went on taking 5-4-3 results in each of the motos to claim the final spot of the podium and has now moved into second in the championship, just a handful of points away from the series leader. Clout proved consistent all day but needed better track position early in the race if he was to pick up a moto win. “I felt pretty good all day and the track was good to ride but I was probably just a bit off in my starts,” he explains. With the track watered heavily and multiple ruts around every corner, it was difficult to move forward at times so getting a good start and being up the front early was the key here. “Everything else was good and its always nice to be on the podium and be right in contention for the championship. It’s a long haul, especially with these back to back races so it’s important to keep logging good results in every race and be there at the end of round 10. 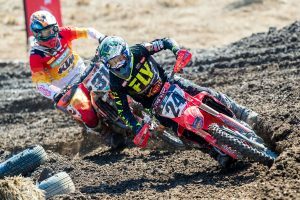 Murray Bridge in South Australia will have a huge impact determining the winner of this years’ MX1 championship as the double header weekend that will see two points scoring rounds on the Saturday and the Sunday will shape the series. Both CDR Yamaha Monster Energy Team riders will be out to put their best foot forward on a track that both have had success at in the past.